She called to me just as I was falling asleep, exhausted from too much travel. We had had a long, twisting drive to reach her sanctuary, perched on the side of a sheer bluff in the Lot region in southwestern France. My husband, Gary, and I had gone to bed early, around 9:30 p.m., too tired to enjoy a night stroll through the tiny medieval village of Rocamadour, which sheltered her chapel. I groaned. I was tired. 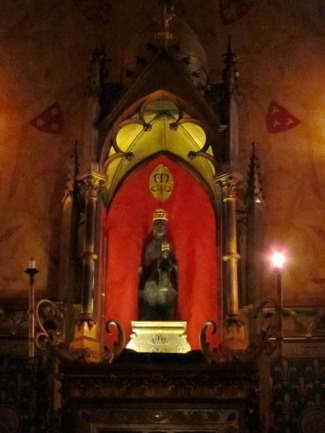 Besides, I’d already visited the Black Virgin of Rocamadour in her sanctuary just a few hours earlier, right after we had arrived, because we’d been told her chapel would close at 7:30 pm. Suddenly energized, I sprang out of bed and got dressed. After all, when the Goddess calls you, you have to go. I knocked at the room next door where our friend Anne was staying. I knocked again, louder. After a few minutes she opened the door, looking sleepy. Soon we were on a night-time pilgrimage to the Goddess, walking through the silent, deserted streets, climbing the 223 steps of the Grand Staircase that lead up to her cliff-side sanctuary. We followed the Rue de la Mercerie to a small square, the Parvis de St-Amadour, center of the holy precinct. Then we walked up to the upper landing and stood in front of the chapel doors. They were locked. I shook my head, disappointed. “I know we were told the sanctuary would be closed, but I’m sure the Black Virgin told me to come and see her.” Maybe it had just been a daydream, I thought, or a moment of confusion as I drifted off to sleep…. We waited a few minutes, enjoying the warm evening, the moonlight on the medieval arches and battlements. Then there was nothing to do but go back to the hotel, so we walked down the steps to the square just below. Suddenly I heard music and saw candle lights flickering in the distance. A group of young pilgrims were processing up the street to the sanctuary, led by a singing priest, complete with portable microphone. Voices rose in melodious harmony, honoring the Virgin. “Ave Marie,” they sang, and “Alleluiah,” their light, sweet voices mingling in the night air. In the midst of the throng, two girls carried a miniature statue of the Black Virgin of Rocamadour on a small, horizontal ladder. Up the stairs the group went. We followed behind them. Soon the doors were unlocked and we entered the sanctuary. “She did call me to come and see her! I was right!” I whispered to Anne. Anne nodded back and squeezed my hand. Puzzled and awed, I stood at the back of the chapel while the priest eulogized the Black Virgin and urged the assembly to express their deep love for her. Faces turned to the tiny figure behind the altar; voices rose in prayer. I wept. 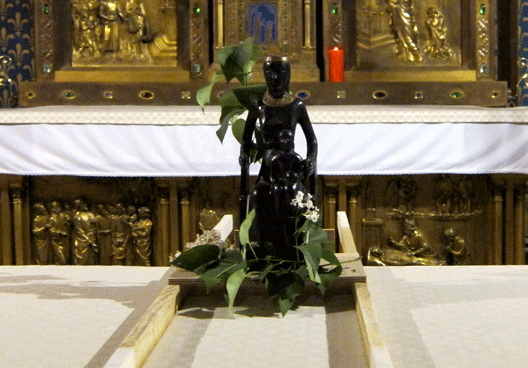 The Black Virgin of Rocamadour is a powerful presence. Dark and strange, almost anorexic, her battered wooden form and the throne she sits upon are carved from a single piece of walnut. A piece of gold ornaments her neck and another piece forms a crown upon her head; the dark child on her lap also wears a gold crown. She is similar to other medieval Black Virgins in that they usually sit on thrones and have a child facing forward on their lap. But she is different, as well: unadorned except for a bit of gold, not covered in carved or embroidered silk robes, she is stark and startling. Some say these Black Virgins (there are hundreds, many of which are still venerated across Europe) are actually statues of the Egyptian goddess Isis holding her immaculately conceived child, Horus, on her lap. Others assert the darkness refers to the “The Song of Songs” 1:5: “She is black because she labored in the fields in the sun.” Many (especially the clergy) claim the black color comes from candle smoke, or the color of the wood, or age, or is because artists thought Mary was sunburned during her sojourn in Egypt, or because she worked in the fields, or because Middle Eastern artists carved her with a dark complexion like theirs, or because Europeans carved her with a dark complexion like Middle Easterners, or…. All these explanations pointedly ignore that no other medieval Christian religious image is similarly black. Regardless of the “party line” that attempts to discredit or ignore the significance of the Black Virgin’s blackness, her devotees know that Black Virgins have a lot of miracle-making juju and are often located on ancient sacred sites of great power. Some say they emit powerful forces because of their carefully measured proportions and because of their position over telluric energies. Feminist scholars and Jungian psychologists assert the Black Virgin is powerfully attractive because she represents chthonic forces and the Earth, the original Great Mother, the cave, the darkness of the soil from which seeds sprout, the recuperative powers of night and sleep, the shadow, the immensity of the night sky, the inner world hidden within each of us, that realm of myth and magic that lies just at the edge of consciousness. Some think that she represents two aspects of the ancient Triple Goddess (Virgin, Mother, and Crone). As I stared at the Black Virgin of Rocamadour, I realized she embodied not just two aspects but all three: purity, fecundity, and approaching death—and regeneration. I looked at the Black Virgin and her adoring congregation. High up in her place of glory, she was the recipient of enormous veneration. She seemed to be soaking it up, as if it were her due. What, I wondered, did she give in return? Miraculous healings, I’d heard. Miracles of all kinds, I’d read. And wasn’t my experience that night a miracle of sorts? After all, I’m not even Christian—and definitely not a “believer” in miracles or the Goddess. But I’d been called out of slumber by an insistent voice. “Come see me!” she had demanded. And the way had been opened before me.